To make the salsa verde: mix together the garlic, capers, walnut pieces, parsley, lemon zest and juice, 1 tbsp of the olive oil and seasoning. Preheat the grill. Brush the sole with the remaining oil and grill each side for 2–3 minutes until the flesh is firm to the touch and the edges are golden. 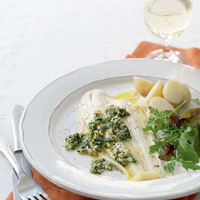 Serve with the salsa verde, new potatoes and a colourful salad, such as Waitrose Earthy Wild Rocket & Chard. Cooking with the fish skin on improves its flavour and holds the fish together when you turn it on the grill. You can choose to eat it or leave it as you prefer. This fresh and simple fish dish would be perfect with Sant’Elisa Tocai Friulano 2008 Friuli Grave DOC, Italy. This delicate dry white exudes alluring aromas of white flowers before gliding across the palate to leavea a delectablenutty note in the finsh that will pick out the walnuts in the salsa.